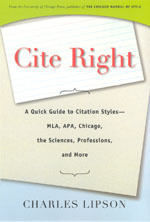 Charles Lipson demystifies the process of preparing citations in research writing in his latest book, Cite Right: A Quick Guide to Citation Styles—MLA, APA, Chicago, the Sciences, Professions, and More. With the humorous, no-nonsense approach he is known for, Lipson offers sound advice for citing in every major style, including Chicago; MLA; APA; CSE (biological sciences); AMA (medical sciences); ACS (chemistry, mathematics, and computer science); physics, astrophysics, and astronomy; Bluebook and ALWD (law); and AAA (anthropology and ethnography). Using simple, easy-to-understand examples from a wide range of courses in the arts, law, and medicine, Cite Right offers an unparalleled range of information on how—and why—it’s so important to cite correctly. At $10 in paperback, no student or researcher can afford to write without it.